St. Louis Horticultural Annual Plant Sale: May 22, 2010, Saturday. Join us for our annual Plant Sale at the Missouri Botanical Garden! The sale starts at 9:00 a.m. and lasts until 5:00 p.m. We’ll have annuals, perennials, house plants, tropicals, herbs and pot makers for seed starting. “Bird Man” will also be there with his wonderful witty yard sculptures. We have something new this year, concrete items for your yard. You can find us at the Orthwein Floral Display Hall, Ridgway Visitor Center. Mark your calendar, you won’t want to miss this sale! 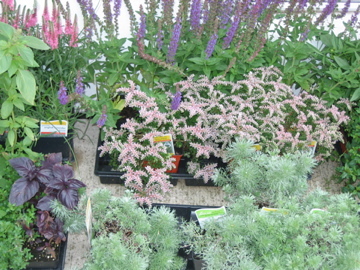 PLANT SALE HIGHLIGHTS: Our sale was a huge success! We had a good turn out, the weather was great, and we had a lot of visitors to the garden. Our members dug a lot of interesting plants from their yards so we had a lot of variety as well as nice purchased plants. Pat’s Concrete brought a beautiful selection of concrete items. Bird Man was here with his delightful yard art. We even had a beautiful selection of palms, hibiscus trees and bushes. Our raffle did wonderful. Congratulations to everyone who won! A special “Thanks” to everyone who came out to help set up and work the day of the sale. We couldn’t do this without you.